Garlic (Allium sativum) is a common food belonging to the lily family and closely related to the onion. Above ground it grows like blades of grass. Below ground is the bulb composed of several divisions called cloves. The garlic has a strong sulfur smell when crushed and is a favored cooking ingredient. Garlic has long been associated with health and has been used for food, medicine, and rituals. Garlic cloves were found in the ancient Egyptian tomb of King Tut. In the first Olympic Games in ancient Greece, athletes ate raw garlic before their competitions. It was fed to ancient Greek and Roman soldiers before battle and was taken to sea along with their sailors.Since ancient times, people around the world have been using garlic for its health benefits. · Used by the ancient Romans to treat convulsions (seizures). · Used in ancient China and Japan to treat depression. · The ancient Greeks used garlic to protect the skin from poisons. · Used by the ancient Romans to treat digestion problems, animal bites, arthritis, and parasites. · Used in ancient China and Japan to treat digestion and respiration problems, male infertility, and to boost energy. · Used in ancient India to treat heart disease, arthritis, fatigue, parasites, digestive problems, and leprosy. 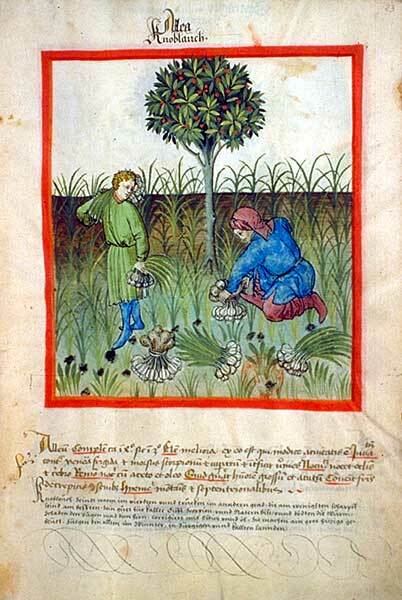 · In the Middle Ages, garlic was used as a treatment for the plague. Today, scientists are studying garlic’s ability to: prevent and fight cancer, lower cholesterol, lower blood pressure, boost the immune system, and treat meningitis. Plant extracts are made up of complex combinations of chemical compounds; it can be difficult for scientists to identify which chemicals are causing a particular health benefit. Scientists know that garlic contains the following chemicals that may have health benefits: sulfur, arginine, oligosaccharides, flavonoids, and selenium. But scientists aren’t exactly sure how garlic helps protect against certain kinds of cancer. One idea is that garlic has natural antibacterial properties. Another is that garlic can help increase the body’s natural supply of hydrogen sulfide, a chemical that helps repair damaged cells, increase blood flow, and protect the heart. National Cancer Institute notes on anti-cancer properties of garlic.